Everything you need to know about Neuroanatomy and Neuroscience … at a Glance! Neuroanatomy and Neuroscience at a Glance is a highly illustrated, quick reference guide to the anatomy, biochemistry, physiology and pharmacology of the human nervous system. 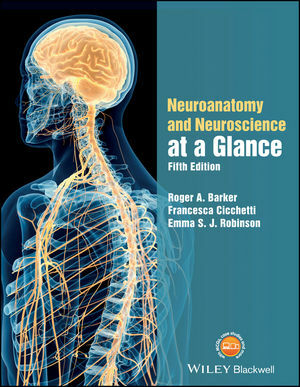 Each chapter features a summary of the anatomical structure and function of a specific component of the central nervous system, a section on applied neurobiology outlining how to approach a patient with neurological or psychiatric problems aligned to the chapter topic, standard diagnostic procedures for most common scenarios, as well as an overview of treatment and management options. Neuroanatomy and Neuroscience at a Glance is the ideal companion for students embarking on a neuroanatomy or neuroscience course, and is an excellent reference tool for those in clinical training. Roger A. Barker BA, MBBS, MRCP, PhD, FMedSci, John van Geest Centre for Brain Repair and Department of Neurology, Department of Clinical Neuroscience, University of Cambridge, Cambridge, UK. Francesca Cicchetti PhD, Centre de Recherche du CHU de Québec (CHUQ), Université Laval, Québec, Canada. Emma S.J. Robinson PhD, FBPhS, School of Physiology, Pharmacology & Neuroscience, University of Bristol, Bristol, UK.